Uveitis is swelling and irritation of the uvea. The uvea is the middle layer of the eye. The uvea provides most of the blood supply to the retina. The eye is the organ of sight, a nearly spherical hollow globe filled with fluids (humors). The outer layer or tunic (sclera, or white, and cornea) is fibrous and protective. The middle tunic layer (choroid, ciliary body and the iris) is vascular. 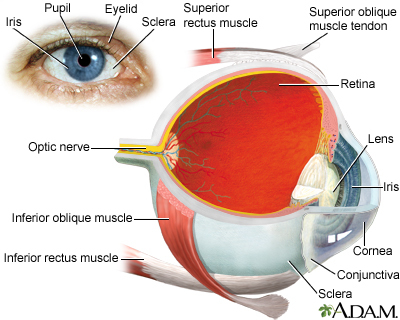 The innermost layer (the retina) is nervous or sensory. The fluids in the eye are divided by the lens into the vitreous humor (behind the lens) and the aqueous humor (in front of the lens). The lens itself is flexible and suspended by ligaments which allow it to change shape to focus light on the retina, which is composed of sensory neurons. 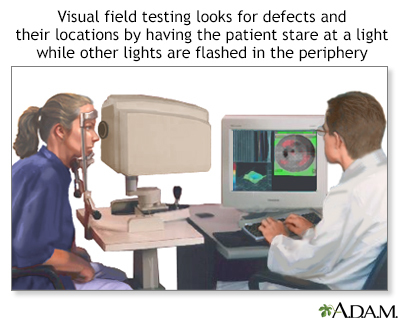 Central and peripheral vision is tested by using visual field tests. Changes may indicate eye diseases, such as glaucoma or retinitis. Exposure to toxins or injury can also cause uveitis. In many cases, the cause is unknown. The most common form of uveitis involves inflammation in the front part of the eye. It is often called iritis because it most often only affects the iris. The iris is the colored part of the eye. In most cases, it occurs in healthy people. The disorder may affect only one eye. It is most common in young and middle-aged people. Posterior uveitis affects the back part of the eye. It involves primarily the choroid. This is the layer of blood vessels and connective tissue in the middle layer of the eye. This type of uveitis is called choroiditis. If the retina is also involved, it is called chorioretinitis. Another form of uveitis is pars planitis. Inflammation occurs in the area called the pars plana, which is located between the iris and the choiroid. Pars planitis most often occurs in young men. It is generally not associated with any other disease. However, it may be linked to Crohn disease and possibly multiple sclerosis. The health care provider will take a complete medical history and do an eye exam. Lab tests may be done to rule out infection or a weak immune system. If you are over age 25 and have pars planitis, your provider will suggest a brain and spine MRI. This will rule out multiple sclerosis. Pars planitis is often treated with steroid eye drops. Other medicines, including steroids taken by mouth, may be used to help suppress the immune system. Posterior uveitis treatment depends on the underlying cause. It almost always includes steroids taken by mouth. If the uveitis is caused by a body-wide (systemic) infection, you may be given antibiotics. You may also be given powerful anti-inflammatory medicines called corticosteroids. With proper treatment, most attacks of anterior uveitis go away in a few days to weeks. However, the problem often returns. Posterior uveitis may last from months to years. It may cause permanent vision damage, even with treatment. If you have a body-wide (systemic) infection or disease, treating the condition may prevent uveitis. Durand ML. Infectious causes of uveitis. In: Bennett JE, Dolin R, Blaser MJ, eds. Mandell, Douglas, and Bennett's Principles and Practice of Infectious Diseases, Updated Edition. 8th ed. Philadelphia, PA: Elsevier Saunders; 2015:chap 117. Gery I, Chan C-C. Mechanisms of uveitis. In: Yanoff M, Duker JS, eds. Ophthalmology. 5th ed. Philadelphia, PA: Elsevier; 2019:chap 7.2. Read RW. General approach to the uveitis patient and treatment strategies. In: Yanoff M, Duker JS, eds. Ophthalmology. 5th ed. Philadelphia, PA: Elsevier; 2019:chap 7.3. Reviewed by: Franklin W. Lusby, MD, ophthalmologist, Lusby Vision Institute, La Jolla, CA. Also reviewed by David Zieve, MD, MHA, Medical Director, Brenda Conaway, Editorial Director, and the A.D.A.M. Editorial team.